If you prefer, you can watch it on YouTube. ‘Mariaan’ is now available as a digital home study download! The study pack takes this lovely solo apart and re-builds your performance – with written music and audio and virtual-keyboard performance files of every step along the way. 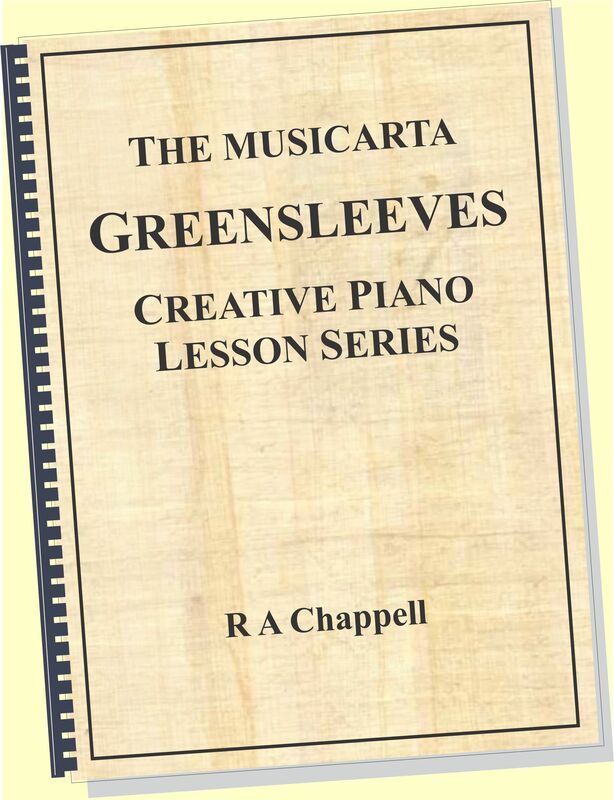 Musicarta wants you to come away from your practising with a sense of achievement. Often, you don’t get that until you’ve learnt a piece through to the end, but ‘Mariaan’ has a host of stepping-stone performances you can celebrate and show off, starting with a 16-bar ‘First Chorus’ performance – with its own ending. 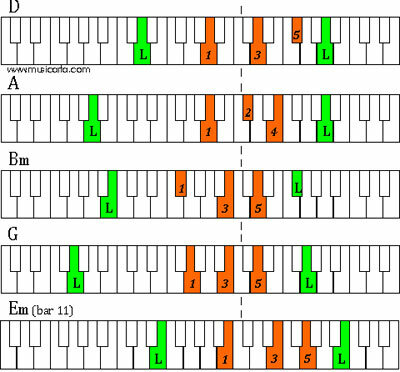 Here are the keyboard diagrams for the ‘First Chorus audio above. The left hand notes are colour-coded green, the right hand notes orange. Here’s MidiPiano playing the MIDI file for this section at practice speed. You can see that with all the resources in the download right there on your desktop, you CAN get this texture under your fingers, super-fast! With ‘Mariaan’, you’re guaranteed to learn something useful and tuneful every time you sit down to play – and you don’t even have to read music! 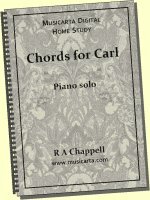 Building to the half-way house Chord Study arrangement (just the chord texture, no melody) is an achievement in itself. Play the audio, and let your imagination relax into it. 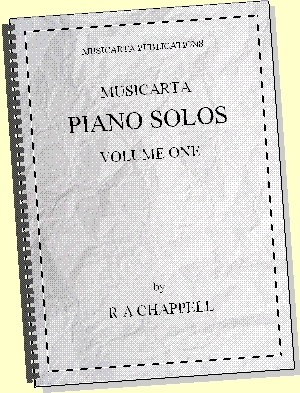 As well as being supremely satisfying to play (and an excellent spring-board going forward), this arrangement is the perfect backing for any solo instrument playing the Mariaan melody. ‘Mariaan’ melody lead sheet music for instruments in C, Bb and Eb is included in your package, plus a guitar TAB version. Or you could just sing the melody over the chords...! 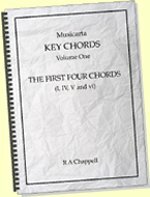 Once you know the Chord Study arrangement, you tackle the business of playing the melody as well. To play the melody as well as the accompaniment, you have to sacrifice some of the broken-chord notes to make room. A close note-by-note look is usually needed to get the ball rolling – and this is where MidiPiano’s ability to slow down the see-what-you-play MIDI performance file is invaluable. You can set MidiPiano to Repeat, slow it down, zoom in and (an old hand's advice) - just stare at it until the penny drops! 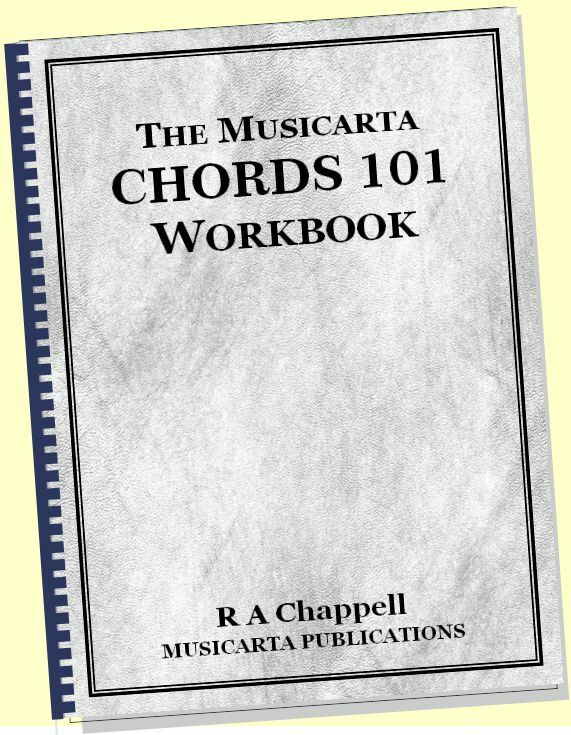 If you want to build a broader theory base, Musicarta has three home study coursse that might interest you. 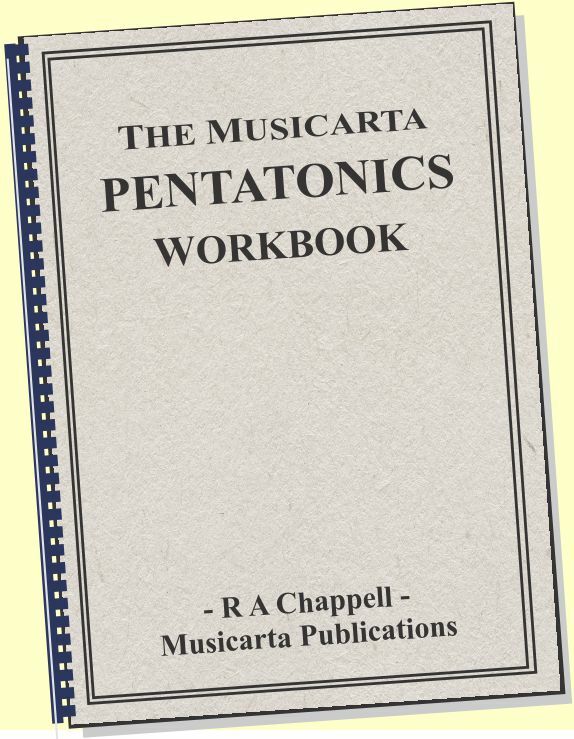 Follow the Canon Project, Pyramids Variations and Musicarta Key Chords ‘Learn more’ links in the right hand column for details. 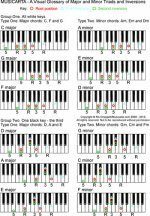 Because the MIDI file is included in your download, you can watch the full set of exercises on MidiPiano (as seen here) and slow the performance down until you can match the speed. With the full music included, you’re sure to make speedy progress. Even if you never end up playing the full ‘Mariaan’ solo performance, you’re sure to add a whole host of tricks to your repertoire. The four-chord set ‘Mariaan’ is mostly based around is the essential ‘starter-pack’ of all musical harmony. Here are a couple of chords-and-bass textures using the same four chords. Songs have been penned with little more backing than that – especially with a band filling out the sound…! You can play any chord sequence using the Mariaan accompaniment texture – or a slight variation of it – and while the combined chords-plus-melody right hand style is the modern keyboard singer-songwriter style stand-by. Here are a couple of closely related improvisations. 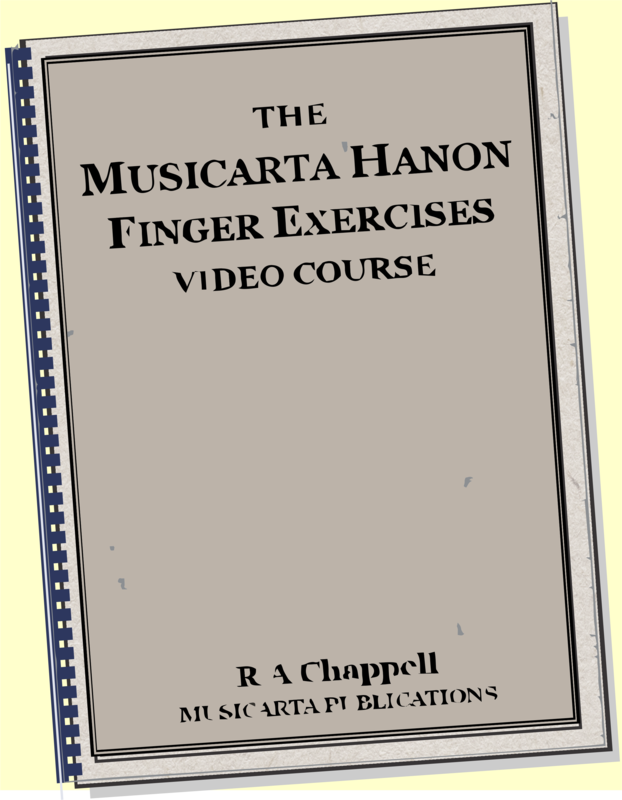 ‘Mariaan’ offers hours of top-class teaching material that’s available nowhere else – for less than the cost of a single piano lesson. Everything you need to get a complete performance into your repertoire – and pave the way for future hours of creative keyboard pleasure. 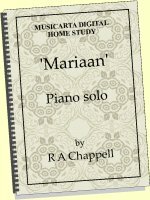 If you’re serious about taking your playing to the next level, ‘Mariaan’ is the solo for you! 'Mariaan' - like most compositions - went through a few versions before settling into her final form. out of interest, here's the original, with the chord sequence beneath. Once you can do the melody-plus-chord-texture trick, you too can combine and recombine these chords into your own composition. Get the Musicarta site RSS feed to stay up to date with development at Musicarta, or visit the blog page﻿ regularly to see what's new. Subscribe to the Musicarta Newsletter for quarterly round-ups and specials.